Getting your tubes tied: Why do young women have a hard time getting sterilized? Why is it so difficult for young women to get their tubes tied? Why is it so hard for young women to get their tubes tied? There are some people who don’t want to have kids. Then there are some people who really don’t want to have kids. As we learned in a recent Double X series of essays exploring this choice, some men and women never heed (or even feel) the tick of the biological clock. But others are more proactive. Monica Trombley is in the latter camp. As described in her piece, Trombley decided at the age of 26 that permanent sterilization by tubal ligation—a procedure colloquially called “getting your tubes tied”—was the right choice for her. “Why should an adult woman be forced to lie to her doctor about why she wants to be sterilized?” she asked. Trombley’s article inspired many, many readers to write in with similar tales of medical odysseys. Often, these women complained of being referred from physician to physician, only to receive a version of, “You’ll change your mind” or, “You’ll regret this later in life.” While some were ultimately successful in their tube-tying quest, others simply gave up, settling for a partner’s vasectomy or contraception. All expressed anger at the resistance they encountered in getting what they assumed to be an uncontroversial and wholly elective—even socially responsible—procedure. Each doctor I went to had the same story—the new ones straight out of med school or the ones who’d been around the block for 30 years. I discussed the fact that getting abortions is much more dangerous than being sterilized and the fact that every time I got pregnant I could get one, but I am unable to get sterilized. It amazed me that they were OK (well at least open) to the fact of having abortions, but not of permanent sterilization which would prevent my ever needing an abortion! … I do believe I faced quite a bit of discrimination. But is it discrimination for a gynecologist to recommend against or even refuse to provide sterilization? Partly, the issue is one of perception. 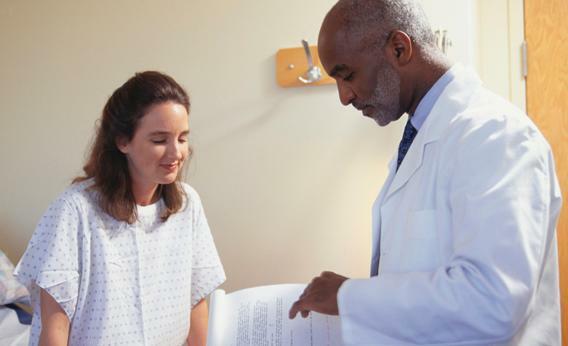 The American Congress of Obstetricians and Gynecologists recommends that doctors provide in-depth and “individualized” counseling of patients seeking sterilization (including a thorough discussion of permanence and other available options). So what some patients take as a condescending lecture or arm-twisting might actually be an OB following professional guidelines. Ultimately, though, the advisory organization does not recommend discouraging or refusing the procedure to anyone who is otherwise medically fit and of the age of consent. It is, after all, a legal procedure. Various forms of female sterilization have been legal in the United States since 1972, when courts removed restrictions that had previously required a medical threat. And according to a 2008 treatment review in Obstetrics and Gynecology, “[A]lmost all women are candidates for these minimally invasive procedures.” So what’s the problem? From a doctor’s point of view, just because a patient can have a procedure doesn’t necessarily mean that she should. While Yekaterina Rabkin, a gynecologist who practices in Winchester, Va., has never outright refused to do a tubal ligation on a patient who’s qualified, she does everything she can to encourage an alternative course of action. So how does it even work? As Rabkin notes, a tubal can be performed with very little trouble just after birth, especially during a C-section. In this case, a section of each of the easily accessible fallopian tubes is removed and the ends sealed, preventing eggs from traveling to the uterus. A similar procedure, called minilaparotomy, which is most often used after vaginal birth, involves raising the fallopian tubes to a small incision site in the abdomen in order to occlude them. For women seeking sterilization outside of the delivery suite, a procedure called laparoscopy is the most common option: After pumping the abdomen full of gas, the physician will access the fallopian tubes through a small incision with a thin, lighted tube. Then the tubes can be ligated using a variety of clips, bands, or cuts. The only nonsurgical option for ligation is the Essure transcervical device, a method in which a doctor inserts a coil of stainless steel and other materials into each of the fallopian tubes, where, upon expanding, they stimulate tissue growth around the coil and, ultimately, result in blockage of the tubes. All of these procedures are relatively safe—the death rate is 1 to 2 per 100,000 for all surgical methods, according to the 2008 review, and a 2000 study found that almost all complications were connected to other health factors, like obesity, and not the procedure itself. But ligation still comes with some small risk of infection, bleeding, and negative anesthesia reactions, not to mention the possibility that it may not even work. According to the Collaborative Review of Sterilization (CREST) study, the 10-year probability of pregnancy following a ligation is 18.5 per 1,000 procedures, about seven of which could be ectopic, depending on surgical method and age. But do these potential complications explain why doctors are resistant to perform sterilization? After all, there are many elective surgeries that carry the same, if not greater, risks. My first thought, like yours, I bet, was that doctor hesitance must have to do with malpractice. But though a patient could potentially sue for a “wrongful birth” if the sterilization fails, it’s far more difficult to litigate if what’s at issue is her regret over having the procedure in the first place. For a court to take such a claim seriously, the claimant would have to show that she did not give informed consent. Considering how seriously practitioners take pre-sterilization counseling (especially with this country’s fraught history of forced sterilization), not to mention the considerable amount of “thinking time” built into the process—Medicaid, for instance, requires a wait period of 30 days in addition to whatever time it takes to get on the surgery schedule—a successful suit isn’t likely. So what about reversal? We have the technology. But as Dr. Rabkin puts it, “It is probably going to be more invasive, not be covered by insurance, and not be likely to succeed.” While statistics vary (25 percent to 87 percent reversal success rates, depending on the ligation method and time since the original procedure), most women—even those who deeply regret their decision—do not actually get one: The 14-year cumulative probability of requesting information about a reversal is 14.3 percent (40.4 percent among women 18-24 at the time of sterilization), but only 1.1 percent of women will actually request the procedure. Post-tubal pregnancy is also possible by IVF, but, once in this territory, the chances of success are slim in inverse proportion to the heft of the medical bills. So what many women experience as “discrimination” at their OB’s office, doctors seem to regard as protection against future emotional pain. But this raises the question of whether a medical professional has any business worrying about a patient’s hypothetical future feelings in the first place. Where you stand on this may depend on how you define “harm” in a medical sense; after all, a core tenet of medicine’s Hippocratic tradition is to do none. So what happens when a doctor considers regret—immediate or in the future—as harm? Is the physician who performed the ligation on a 24-year-old (knowing that there was some significant possibility that she would later regret her decision) responsible for her 35-year-old heartache? Medical ethicists take this question very seriously. Philosopher Piers Benn and gynecologist Martin Lupton considered the issue in a 2005 paper, writing that one must first decide if so-called “lifestyle” surgeries fall under the purview of medicine, and, if so, should patient autonomy be respected, even when the doctor feels it’s not in that person’s best interest? If autonomy is the issue, the idea to explore is that the putative late wish to be able to have children is more autonomous than the earlier wish never to have any, perhaps because we get more experienced and mature as we get older. Although this may sometimes be true, it will not always be. The fact that one wish comes later than another one does not make its fulfillment better for me, nor does it make it more autonomous. Rather, we simply face a judgment call based on the facts of the particular situation. Benn and Lupton come down on the side of the patient, though not gently: While the authors write that later regret “should not be a factor in a doctor’s decision about whether sterilization is in the patient’s best interest,” they also offer no balm for the patient’s future emotional distress. If a young woman’s resoluteness is as valid as an older woman’s regret, the doctor’s hands are clean. Dr. Denise Jamieson, a practicing physician and chief of the Women’s Health and Fertility Branch at the Centers for Disease Control, is also supportive of a patient’s right to choose, though she notes that the statistics don’t lie. “As a clinician, I know that regret is so common. Patients come in heart-broken because the situation has changed, and now they desperately want a child. It makes you feel bad as their physician,” she said. But, as our reader reports demonstrate, Jamieson and the ACOG may be out of touch with what’s actually going on in the examination room. In a 2010 survey of American gynecologists, researchers found that doctors responded to hypothetical patients’ requests differently depending on age, number of children, and spousal agreement. For a 26-year-old with one child and a disagreeing husband, almost 70 percent of physicians were “somewhat or very likely to discourage her.” Predictably, older imaginary women with more children and accordant husbands were far less controversial. During our conversation, Jamieson stated very directly that, when it comes down to it, “Doctors should offer medically appropriate care.” I was relieved—finally, a straightforward answer! But as it turns out, it’s not that simple.